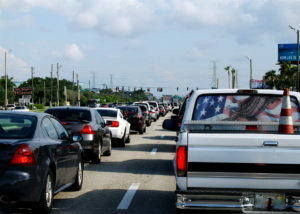 Forward Pinellas employs a congestion management process (CMP) to identify and respond to problems of recurring and non-recurring traffic congestion. Recurring congestion is caused by more users of a road or intersection than it can handle. Non-recurring congestion is a result of crashes, emergencies or special events. Both contribute to delays that cost people time and money. Congestion management strategies provide lower cost alternatives to major capital investments that are considered in identifying improvements necessary to address roadway congestion. The CMP Policies and Procedures Manual provides an overview of the federal and state requirements pertaining to the CMP and describes how Forward Pinellas evaluates transportation system performance measures for application of CMP strategies. These strategies typically include small scale physical improvements such as intersection modifications and median closings and intelligent transportation system (ITS) applications. Intelligent Transportation System (ITS) improvements maximize the operational efficiency of the road network and include signal timing coordination, traffic monitoring devices and dynamic message signs. Additional ITS technology includes real-time congestion and auto travel information, transit trip planning, mobile ticketing, bike/car sharing, and vanpooling technology. Travel trends and patterns evaluated for the Congestion Management Process are reported annually in the Level of Service and biennially in the Countywide Trends and Conditions Report, which includes information on roadways, public transportation and non-motorized transportation. Improvements, identified through the CMP, are implemented through the Transportation Improvement Program.